This will be our first video game ever. It will (tentatively) be called "Laundry Day". It will be about, yep, you guessed it, doing laundry. Exciting I know. But check out the video footage of what we have so far. Elizabeth did all of the artwork, I did some of the game scripting, and we both did the music. Keep in mind, we JUST started on this, so it is nowhere near complete. Just what we have so far. We finally got our save-the-date postcards back! I sent the design out a few weeks ago, to be printed, but our frugality drove the decision to go with the cheapest shipping, so we just got them a few days ago. They turned out pretty well, for the price! We have been gathering addresses and filling out save-the-dates all weekend. It is a little on the overwhelming side. 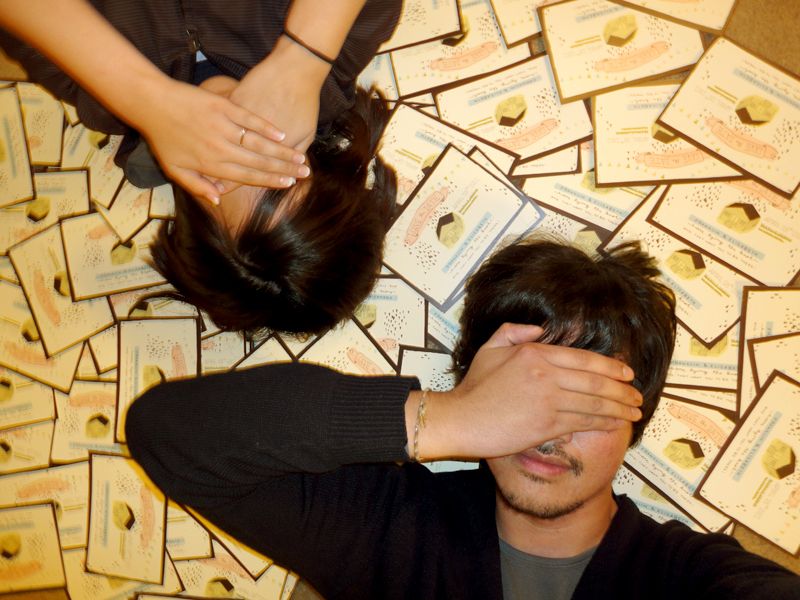 We just need a few more addresses and we'll be ready for a trip to the post office. Hooray! Also, I read that, typically, if a save-the-date is sent out, an invitation should be sent out later as well. I guess I don't understand the necessity of that. Would it be completely weird if I only sent out save-the-dates and skipped the invitation nonsense? It seems sufficient to me, anyway! Plus, if I can cut any corners, I WILL. 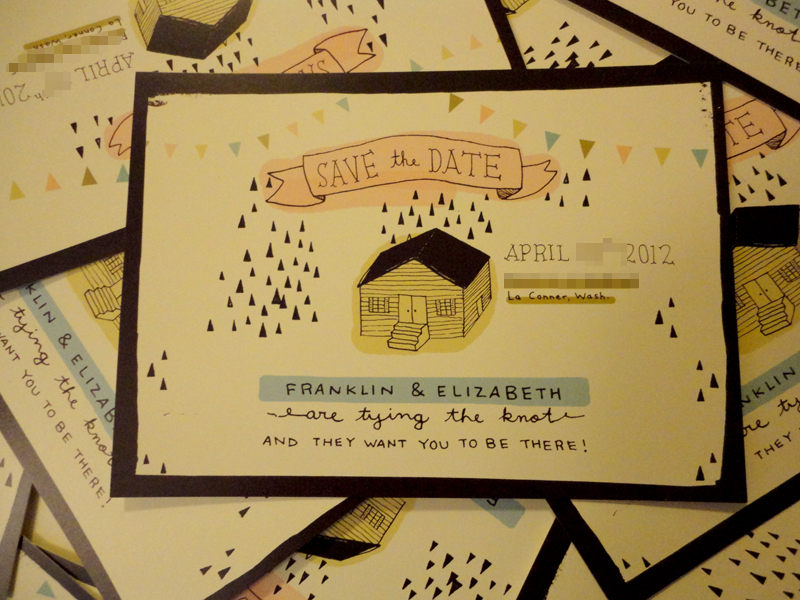 I'd rather have more money to feed and entertain at the wedding, than waste on additional printing and postage. Franklin & I decided that, at least once a week, we'd both teach each other something. Yesterday, I taught him how to use a sewing machine. He was a pretty quick learner! and also learned quickly, that one must respect and, above all, FEAR the sewing machine. She is a fickle & vicious machine, she is. He even mastered the slow-and-steady pedal move. It was amazing. He learned how to wind a bobbin, thread the needle, pull up the bobbin thread (I'm sure that action has its own fancy verb, but I don't know it), and he even learned how to follow curves! haha. Anyway, enough praise for Franklin. 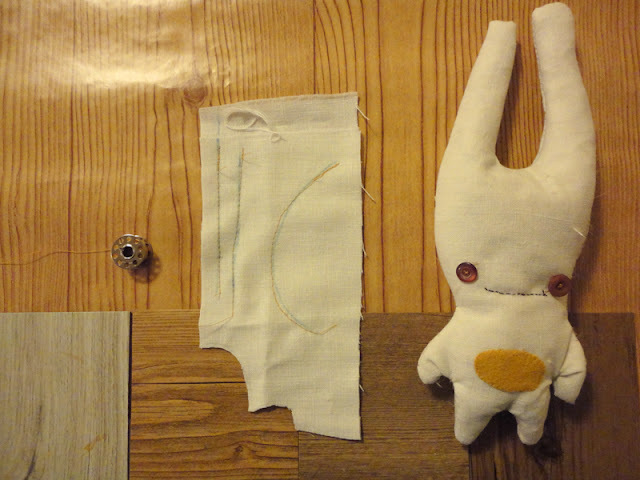 Here's a picture of the bobbin he wound, a piece of practice fabric so he could feel the mighty & unforgiving power of the sewing machine, and the finished product: a very creepy bunny that we named Oliver. 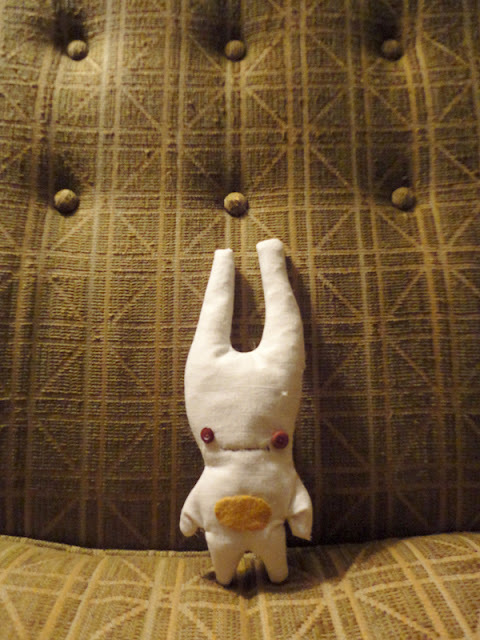 We were listening to deerhoof when he made him, if that's any explanation for the way he looks. Next, Franklin's gonna teach me to play the drums! teehee. Quietly, though, 'cause we are apartment dwellers. Oh, and, tonight... I wasn't going to let anyone know, but, tonight he's gonna teach me how to play Magic the Gathering. Increase my nerd value, I guess.